Some consider them ugly, while others find them adorable. Either way, Sphynx cats are impossible to ignore, both because of their unusual appearance and because of their energetic, friendly behavior. While it’s possible to find descriptions of bald cats since the ancient days, the first attempts to breed what would later be known as the Sphynx cat began in 1966, in Ontario, Canada. 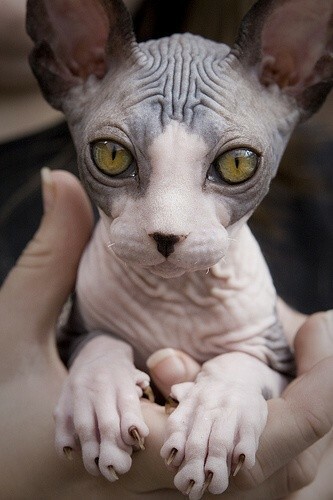 A black and white domestic shorthair cat gave birth to a hairless kitten named Prune. Prune was later mated to other cats, and the new bald kittens were called Canadian hairless cats and nicknamed Sphynx cats, because they resembled the ancient Egyptian sculpture “The Sphinx”. Between 1975 and 1978 other hairless cats were found in Minnesota and Toronto. These cats, called Epidermis, Punkie and Paloma, were bred to Devon Rex, a cat breed with little body hair (this practice was later abandoned because the kittens had health problems). The Sphynx breed comes from the offspring of those unions. Today, after a lot of trial and error, the breed is healthy, with a sound gene pool. The Sphynx cats are usually muscular, with a medium length torso and a full, round abdomen. The neck is also muscled and medium length. Heads are wedge-shaped, with prominent cheekbones, large, lemon-shaped eyes and big ears with no hair inside. The paw pads are typically thick, and the tail is thin, sometimes with a puff of fur at the top. Although they are called hairless, they are actually often covered with a fine down, and touching them feels like touching a warm peach. They look somewhat similar to other hairless cats, like the Peterbald and Donskoy cat, but are genetically different: the Sphynx hairless gene is recessive, while the Peterbald and Donskoy genetic mutation causing hairlessness is dominant. Sphynxes are very extroverted. They are energetic, curious, playful, and very affectionate. Sphynxes hate being alone, and can become depressed if they’re without company for a prolonged period of time. Friendly humans, friendly animals (not necessarily cats); they’ll be happy with either (or both), as long as they’re not alone. While they look like low maintenance cats and many people suffering from cat allergies can tolerate Sphynxes, their lack of fur makes them vulnerable in many ways. Their skin and ears secrete just as much oil and wax as the skin and the ears of a furred cat, so it’s necessary to bathe them once a week and to clean their ears. They might get very painful infections otherwise, not to mention they will leave greasy stains everywhere. Since they have no fur to protect them from the cold and the sun, a sunscreen may be necessary (they can get sunburns even from sleeping in the window), and they must be in warm places. Sphynxes are smart and they will seek out those warm places (humans, friendly animals, heated parts of the house), but it’s up to the owner to provide them. They can go outside, but can not survive as outdoor cats. Overall, while keeping Sphynxes can be demanding in terms of providing company, cleaning and warmth, these curious, playful, affectionate cats are well worth the effort. Definitely strange looking, but so friendly! I don’t find them particularly cute, but these two are looking pretty cute wrapped up in their duvet!